After an auto injury, some patients will develop widespread chronic pain. Years ago, these people were thought to be faking or exaggerating their injury pain. 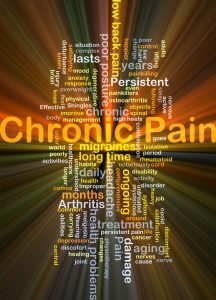 However, we now know there can be actual changes to the brain and nervous system that are the cause of this chronic pain. During an auto collision, the muscles, ligaments, discs or nerves of your neck can be stretched or torn. These injured tissues then become inflamed or swollen and begin to send pain signals to the spinal cord and brain. If treatment of the injury is not started right away, it leads to a negative cycle. The areas that have been injured continue to send out pain signals, bombarding your nervous system and causing it to become over stimulated or sensitive to the pain signals. This makes your body over sensitive to pain general. Research has shown that those injured in an auto accident demonstrate evidence of this happening. When these patients are examined, it is found that they are more susceptible to pain in the feet or hands, far from the original problem. Other research, using PET scans, reveals actual changes in the brain’s function with this chronic pain cycle. When your nervous system has become over sensitive, it can take time to reverse this change this negative cycle and restore the normal function. If you are suffering chronic pain from an injury, we can help! Research shows that chiropractic is one of the most effective treatments for auto injury related pain. It has also been shown that chiropractic has a positive effect on the pain centers in your brain. By pinpointing the root cause of your pain, we can develop a treatment plan to help you recover your health. Don’t suffer any longer! Call our office at (314) 731-4383 or CLICK TO CALL AND MAKE AN APPOINTMENT today! As a 1984 graduate of Life Chiropractic College, Dr. Martin Schmaltz has years of helping those who have been injured in auto accidents. He has extensive training and study in how the injury happens as well as the specific treatments and documentation to help his patients. He has a great working relationship with many attorneys in the St Louis area and is known for his detailed notes and diagnosis of the injured patient.